One of the biggest factors in our collective floundering is our quest to ‘have it all’. And by ALL I mean literally everything. We consume so extraordinarily fast that we cannot keep up. We are so ‘connected’ yet struggle to linger over meaningful conversations. We struggle with obesity at national levels. Our houses are so large we can barely maintain them. Most of us cannot actually afford the lifestyle we affect and have mountains of debt. Most women I know have at least a few items in their closet with the tags still on them. As for our children, there is so much in the way of expectations it is difficult to pencil in time for them to just be ‘children’. If you are a parent, you will most likely be nodding your head about now.. The feeling of having your weekends booked out months in advance, the living and eating in our car, the ‘not being able to make every single activity/playdate/school event’ leaves us in puddles of overwhelm and guilt. It is exhausting, it affects our relationships with others and with ourselves. We can also find ourselves subject to myriad health conditions such as anxiety, depression, gut and bowel problems, and migraines. I am guilty of being on the consumerism bandwagon for the majority of my life. That has been changing over the last 12 months, and the feeling is like no other. I have four children and another on the way. While we always wanted a big family the sense of chaos is very, very real! We are involved in our local surf club, own three businesses, are part of a charitable association which puts on fundraising events and have a beautiful large house near the beach. We are very lucky, but were so busy that we realised that we weren’t actually enjoying this great life. If I had downtime, it was always accompanied by a lingering sensation of guilt that I ‘should be doing something’. My life was going by in a blur, and the only memories I had were the ones on my camera roll (of which there were thousands because if you didn’t take a pic, did it even happen?). A while ago I decided to start saying ‘no’ which was unbelievably liberating. Now it is my favourite word. But what is ‘slow living’? There is a huge movement towards the concept of ‘slow living’. Essentially, it represents a change in attitude to aspects of your life. It may mean letting go of some things in life, downgrading, saying no, or reducing the burden of time, labour and stress. It may also be as simple as taking a mindful approach to some aspects of your life. For some, growing their own produce in a little kitchen garden teaches us the work, time and value in producing something as simple as a dinner’s worth of beans. We cannot speed up the time nature will produce these beans, or lessen the work required to grow them, so the act of accepting and living in the moment allows us space to breathe and teaches us to wait. Those beans will grow and mature when they are ready. 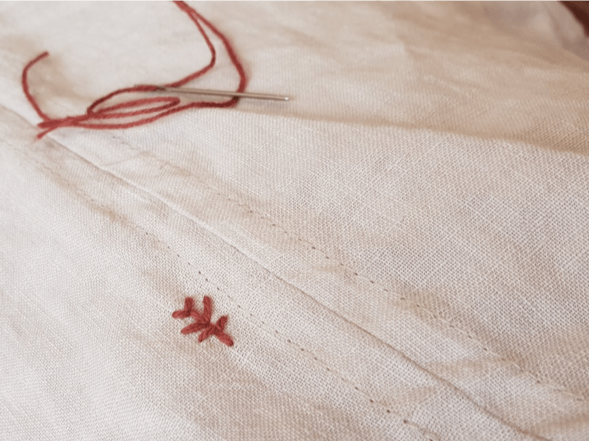 A simple act that teaches me to breathe is the act of embroidering my mark onto each garment I make. The time it takes me to do that allows my mind to slow; to wonder who will go on to wear this, to reflect on my journey so far, or to just blank out and enjoy the process. These are tiny things; I am still just starting on my own journey to ‘slow’. I will be sharing some blog posts on how to practically take some steps towards a slower lifestyle, so if you are interested in anything in particular, let me know below!